The winner of the hackathon and the people’s favourite was the educational platform 3Ducation, which helps explain various natural phenomena to school students. The creators of the winning platform are four Ukrainian women who study at Tallinn University of Technology – Anhelina Prokopenko, Roksolana Sliusar, Valentyna Tsap, Valeriia Rusakova – and Panagiota Chatzi, who is a student at the University of South Wales. “We are offering an educational platform that uses the technology of AR, 3D-animations and usual paper cards that will teach you in a fully new way!” said member of the winning team Panagiota Chatzi, who was also named the best engineer at the hackathon. The winners intend to develop their platform further and expand it so that it can also be used to teach mathematics, physics, geography and biology. The special award of the IT Academy went to the UniPal application, which allows students to sell the study materials they have created themselves and earn some money. The special Microsoft award went to the Copo application, which helps university and school students find teammates for various projects. These projects lay the foundation for the student’s portfolio, which they can use when they start applying for jobs. The special Skype award went to the web application Listen Together, which offers video calls with elements of entertainment, e.g. singing karaoke together etc. 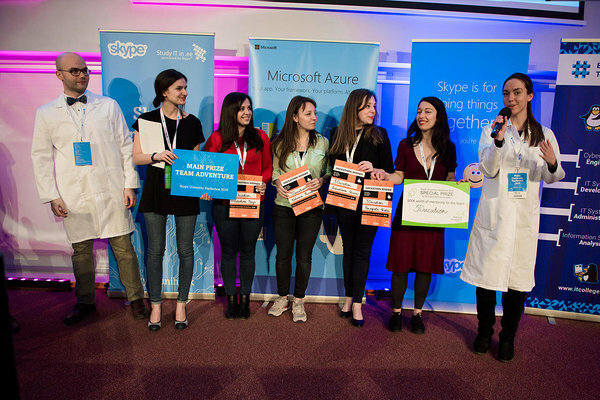 The teams that took part in the Skype University Hackathon 2016 were rated by a jury whose members included Filipp Seljanko (Skype), Kaspar Hanni (Microsoft), Triin Mahlakõiv (Tehnopol), Lauri Võsandi (IT College), Juhan Ernits (TUT) and Peep Küngas (UT). The main organisers of Skype University Hackathon 2016 are Skype Estonia and, within the programme of the IT Academy, the Information Technology Foundation for Education. Hype event marketing agency also supported the organisation of the event. The prizes were provided by Tehnopol Startup Inkubaator, Skype, HITSA, Microsoft, Latitude59, Estonian Association of Information Technology and Telecommunications, and TechSisters.